Any update photo's of this awesome looking switch ? Thanks for asking.......I have been on "light duty" orders from the VA for the past six weeks! I "tore" a muscle (and severe muscle spasms) in my left hip (too much for a 74 year old :) ) and now going through "therapy" to repair. Stopped the turnout building right now! Hopefully I can get back to this turnout in a month or so and get it finished. I will build the second #5 switch using the full on "kit" and not do all the machining myself. Just too much work for the extra $425 I would "save". Sorry to hear of your owie. I pray you heal quickly. Gary how is the recovery going ? PT is also called personal torture .. You're doing well I hope . Hey Sean....thanks for asking :). as a matter of fact, I have been back at it building the turnout for the past week or so. But not nearly the pace I was going before the muscle acted up :(. 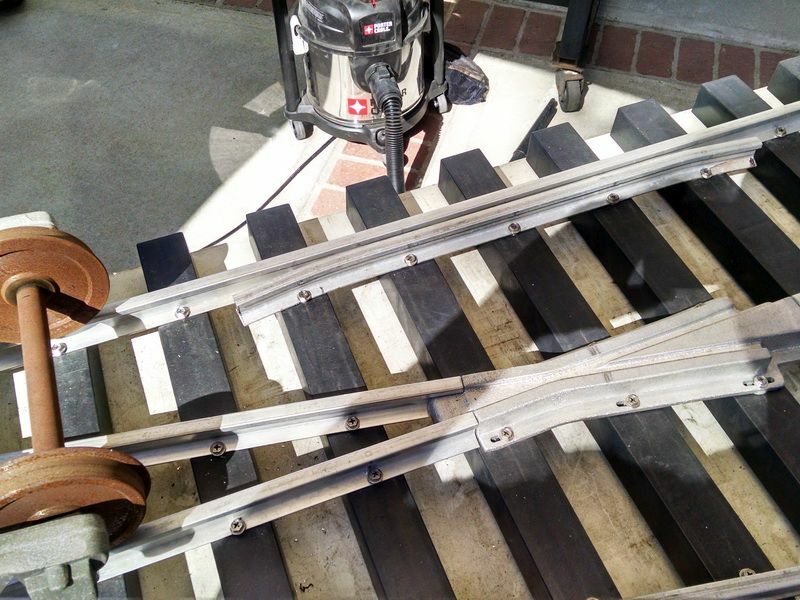 I'm working on the last few ties and drilling the base of the rail for track screws. Long and tedious process. 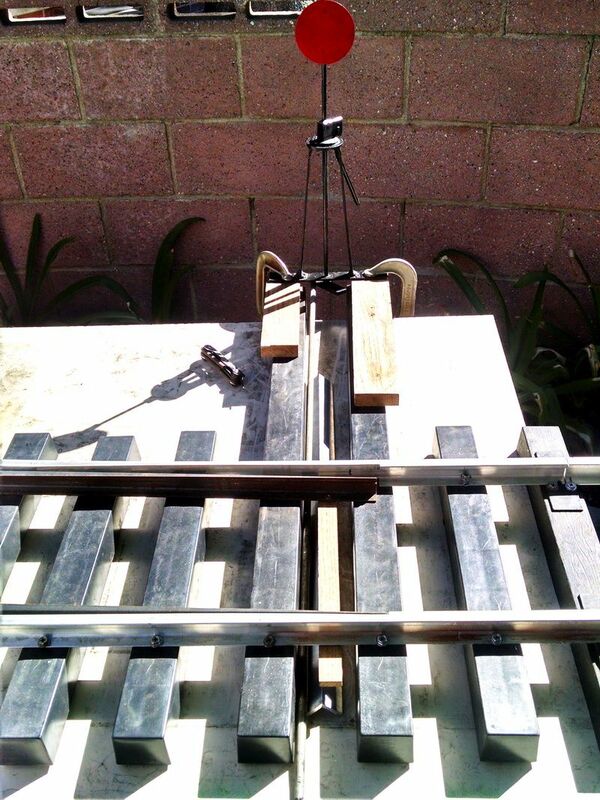 Using gauges to keep the track in place and at proper gauge. I drill though the rail base right into the plastic tie. 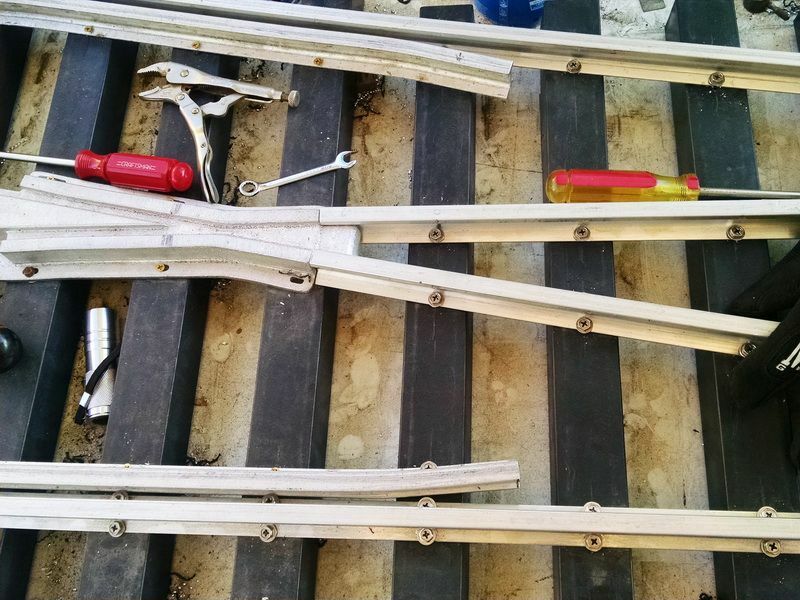 Once the ties and rail are "match drilled", I will then dis-assemble the entire turnout and drill the ties for the hole size for the #10 screws. Then assemble for good! Yeah, that will be a day to celebrate. 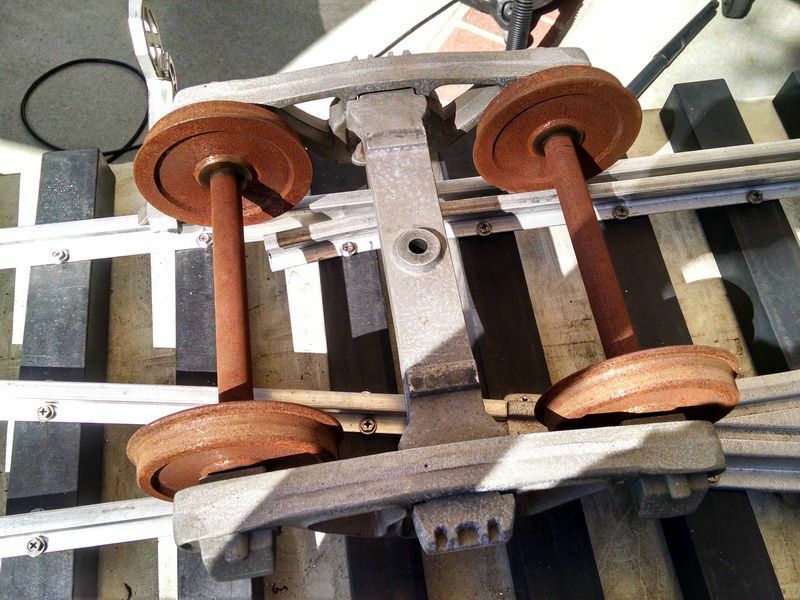 Randy Lehrian (posts here on LSC) emailed me in July to say he had bought two #5 turnouts (RH and LH) in the full kit form and had one turnout unboxed and assembled and complete ready to use on his living room floor in less than 90 minutes. That made me "cringe" and I then decided that I would build my next turnout from a full on kit :)! Don't get me wrong....this was a great building experience and it was the first turnout in ANY scale, I have ever made. I guess I enjoy a good challenge. Now I know I can do it! I get some photos and post them here in a day or so. Sorry to hear about your hip problems Gary. Glad to hear you're beating the issue and getting back at it. You've definitely been an inspiration to me and I don't know that Id have any 7.5" track down at this point if it werent for your tantalizing threads on the subject. Yes your switch really looks nice but the process you went through to get there looks near sisyphean. when I received my switch, I threw the boxes of parts on the living room floor ripped them open and started following the instructions. After a bit it was ready to drag out to the yard. I haven't had a bit of trouble with it despite all the grass growing up though it, but that is another story. I really need to start a thread on my 7.5" adventures but this has just been a busy year with some big projects at the new house. They should be wrapped up by winter making next year, "The year of railroading"
That switch looks right at home, even if it's the left . Wow, that really looks nice Randy. Yeah, I'm going the full kit route next time :)! I hate to add up the hours I have in my switch AND I'm not even finished yet! Looks just right next to the tree. Next year, setup a short piece of track and everyone can ride AROUND the tree and not UNDER it :). Ya I had to lookup " Sisyphean" . Don't worry John, Righty will get his day too. But if I used him now it would sent the flat car full of grocery's to the pasture instead of the back door! 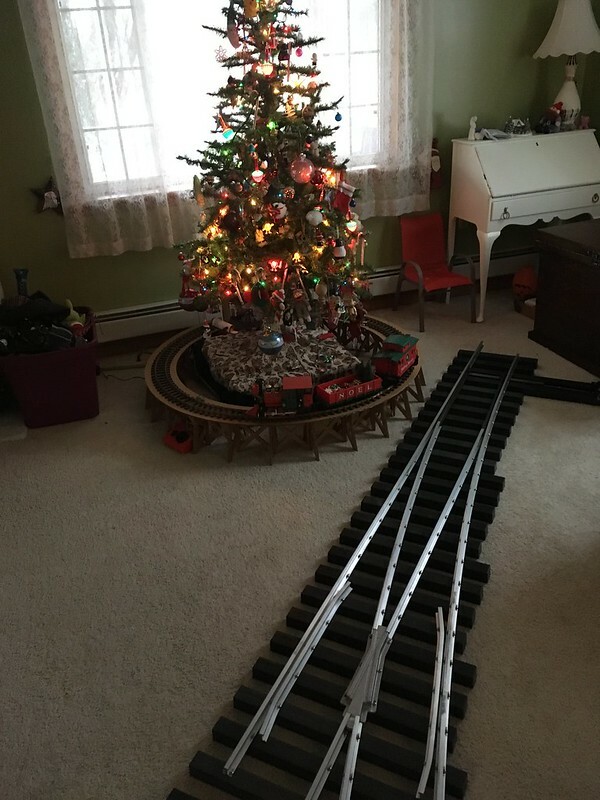 Next year, setup a short piece of track and everyone can ride AROUND the tree and not UNDER it :). Yeah, I feeling a real kinship with that fella this year. My "old body" has healed up as good as it's going to get and I'm back at the turnout build. Finally on the final assembly and installation on my railroad is "just around the corner" :). 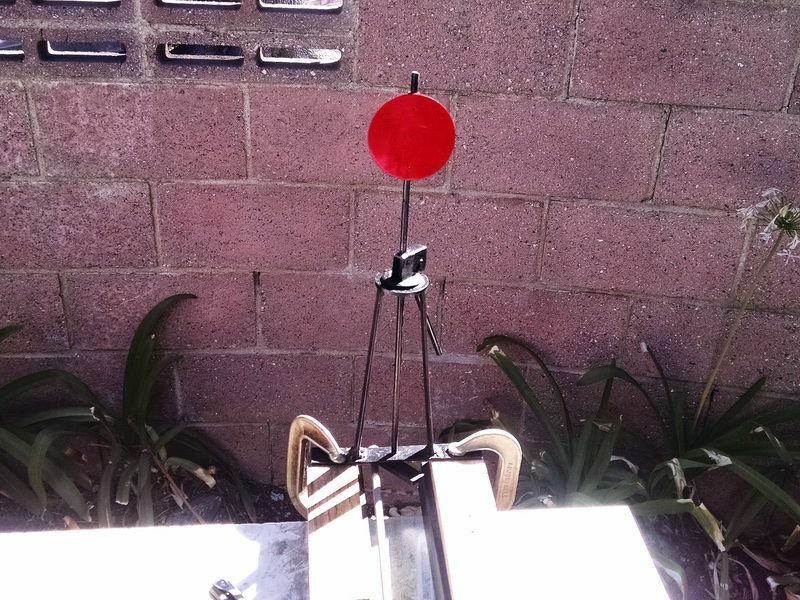 All the rail has been drilled and the ties have been "match-drilled" and the switch has been "temporarily assembled" to check gauge, operation of the points and geometry of the frog. That proved to be correct, so now I am drilling the ties with a correct "tap" drill for the #10 X 1 inch long stainless steel track screws. I drilled the "clearance" holes for the screws in the aluminum rail. There are a total of 162 screws holding the turnout together. I took these photos a couple of hours ago showing the final assembly. First two photos showing the entire turnout and the "tail track" for the siding off to the right. The switch at this point is about 12-13 feet long from the point end to the other end of the tail track. I believe Sean was asking aboiut how the frog attaches to the turnout and the closure rails. These close up photos show how the frog is attached to the ties and the closure rails. It's a very substandial and sturdy assembly. There will be 500 pound locomotives going through this along with 150-200 pound rolling stock. A day or two more and it gets placed on the ground. It will be interesting to see how much this weighs. I'm figuring about 50-55 pounds. 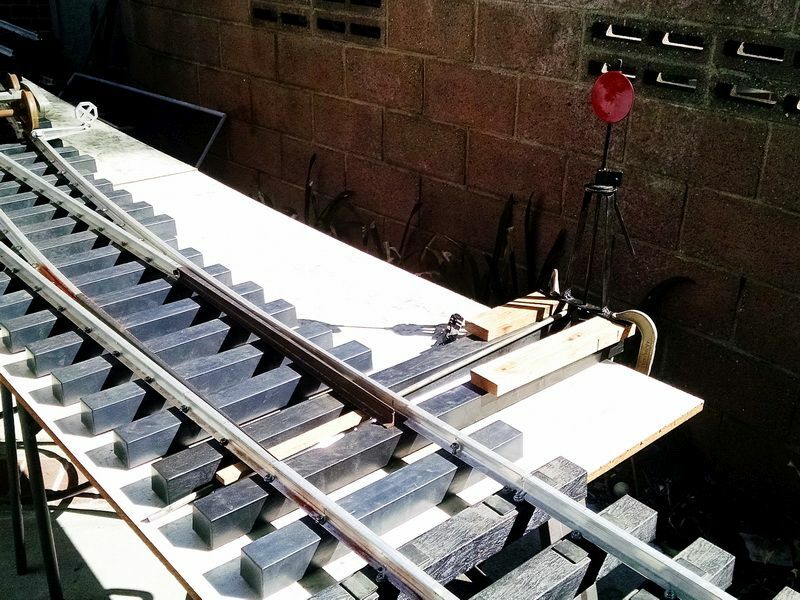 The last thing to do is install the scale model switchstand on the two longest ties near the points. That came out so sweet! Well I don't know how many of you are watching this, but today was a big day......I finally finished this 7.5 inch gauge #5 turnout. So now I have cleaned off the assembly table, put my tools away and vacuumed the dust, dirt and removed any other miscellaneous crap. Surprisingly I didn't lose any tools :)!! A few photos of the completed turnout project. Like I have mentioned before, I will NEVER build another one of these from scratch. Way too much work and very time consuming. 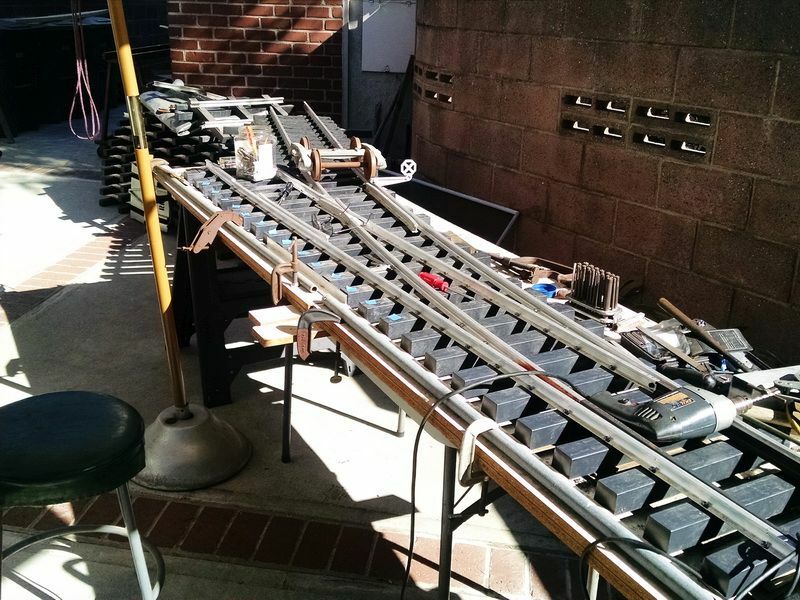 I have about $225 in this for materials (includes rail, points, cast frog and stainless steel screws). 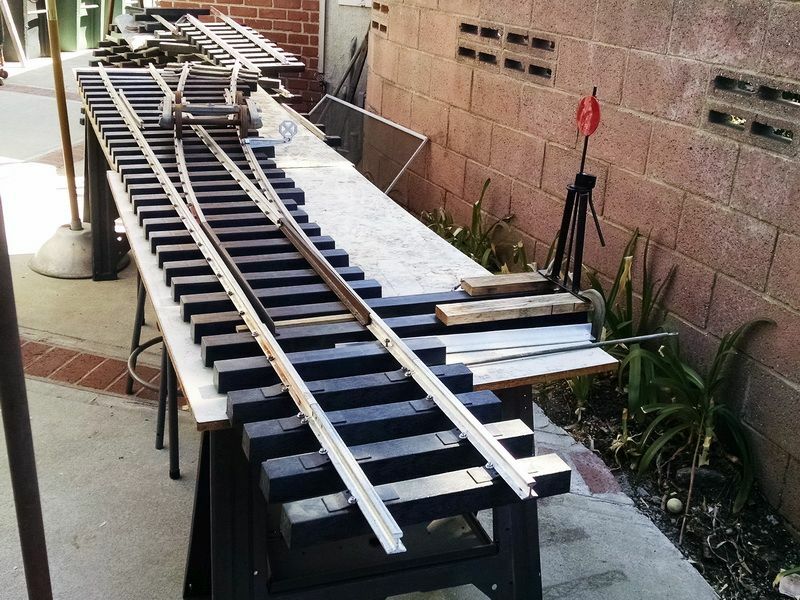 The rest is all labor for the machining of the rails, which I did myself. I could have purchased the full kit (like Randy Lehrian did) for an additional $400 and had the switch completed in 90 minutes! Not the many months it took me :(! But I DID get the satisfaction that I could actually build one of these if I had to :). Below are the photos I took this morning and later on in the day, of the completed switch. The tail track for the diverging route is in the background. About 4-1/2 feet long. 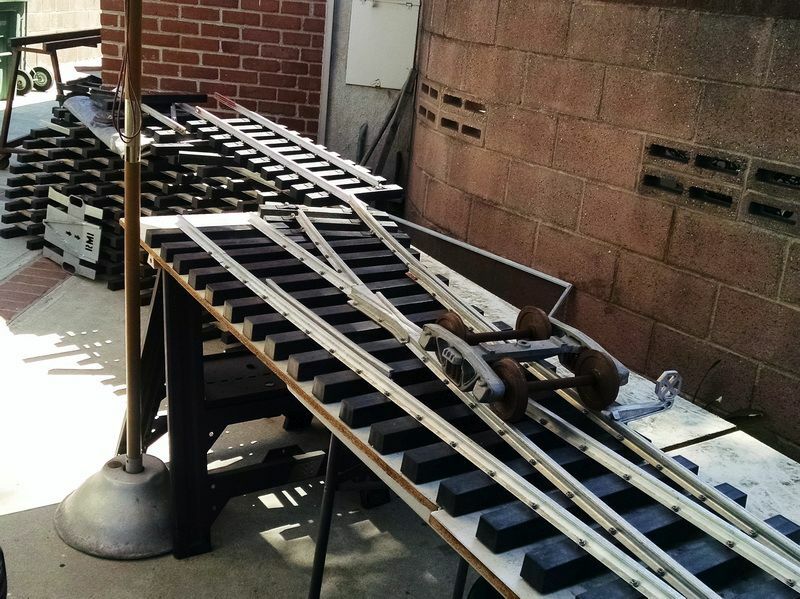 This track will eventually lead to my 10 ft. lifting rack (when the switch is on the ground) and then I can roll the cars and engines off of their storage racks, lower to the ground and roll onto the switch and the mainline of my layout. No "five finger" lifting tools with this scale! In this shot, I was adjusting the switch stand target to "read straight". Everything is fully adjustable on the miniature switch stand. Test trucks on the straight section and the target lines up. Working on the miniature switch stand getting the parts lined up for the throw bar and mechanism. Switch stand and parts for throw bar. I have to machine aluminum spacer blocks to replace the wood spacers in this photo. A little bit of "tweaking" to make this stand work with this switch. Another shot of the switch stand. It stands about 18 inches. Close up of the frog and one of the guard rails. Straight guard rail and frog. A beautifully built switch, but we expected no less from you . I think that bridge over the pool is a great idea, give you some place to jump from when you go swimming. Thank you Rick. 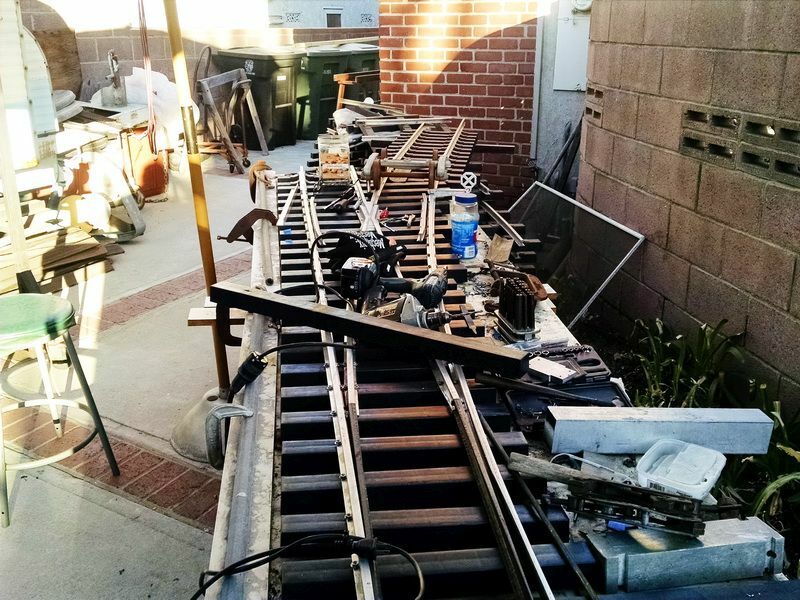 What really surprised me was the amount to setup and machine the rails. I've been doing this kind of work for fifty plus years and never saw this coming. I lost enthusiasm a couple of times and then I would be invigorated again. Maybe it's the age or like Indiana Jones said in "Raiders", "maybe it's the miles" :). Tomorrow I start the mounting blocks and throw rod mechanism and then it's down the home stretch. :). Thanks again Buddy for your inspiration. Mate it may have taken some time but you did it and it is terrific. 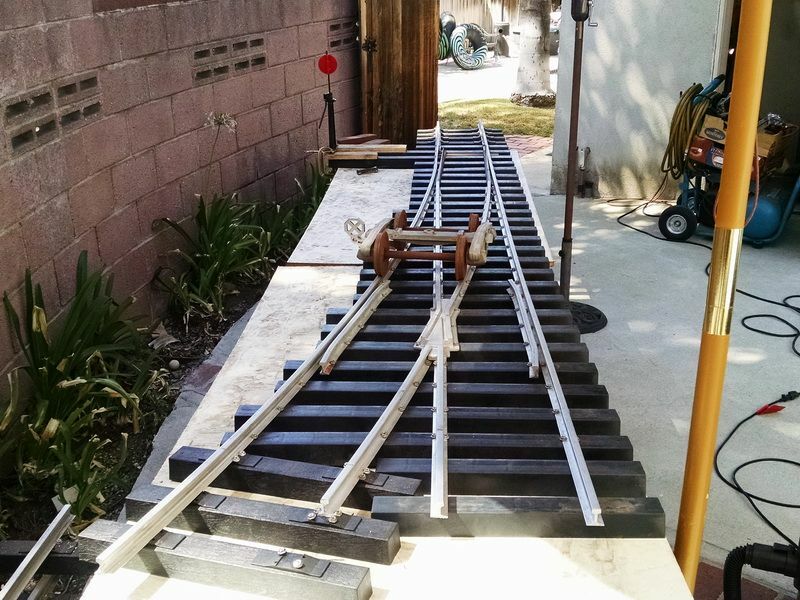 Is that a typical setup, having the track screwed down to the ties? Been to a few ride on layouts and never really paid attention to how the track was fastened to the ties, especially on a switch. But it does make sense. This should look great on the pike! Turned out great Gary! You’ll get an overwhelming sense of satisfaction every time you look at it, knowing you did the job yourself. I also have to vote yes on the bridge over the pool! Just tell the CEO it’s our fault, that we all demanded it. i think you will be able to get the spring action you want, you’ll just have to pick the right springs with the proper heft to do the job. If I was going to leave my switch where it was at I’d be doing the same thing to it. I’ll se we’re it ends up in the new plan be fore I go and do that thought. I look forward to the switch stand updates! 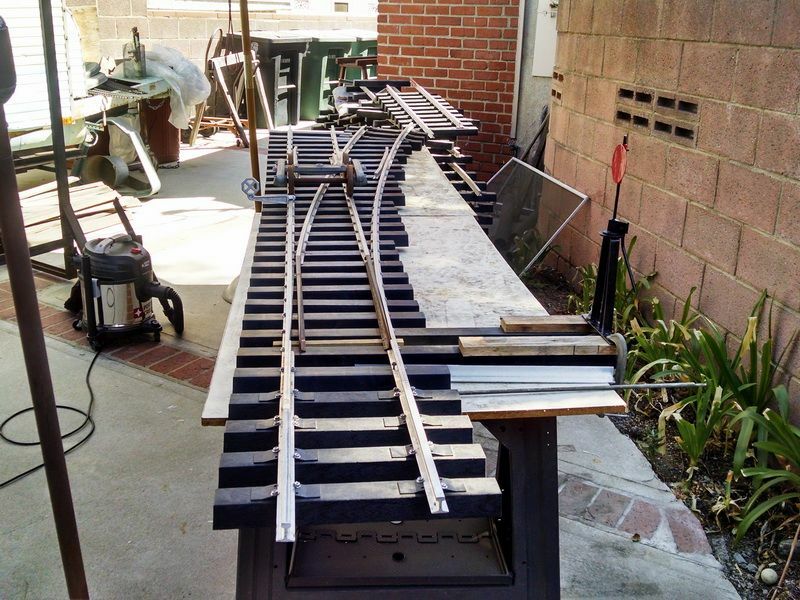 Ken: No this is NOT typical (screwing the rail down to the ties, through the rail. Most clubs use tie plate and then the screw head clamps down on the foot of the rail. 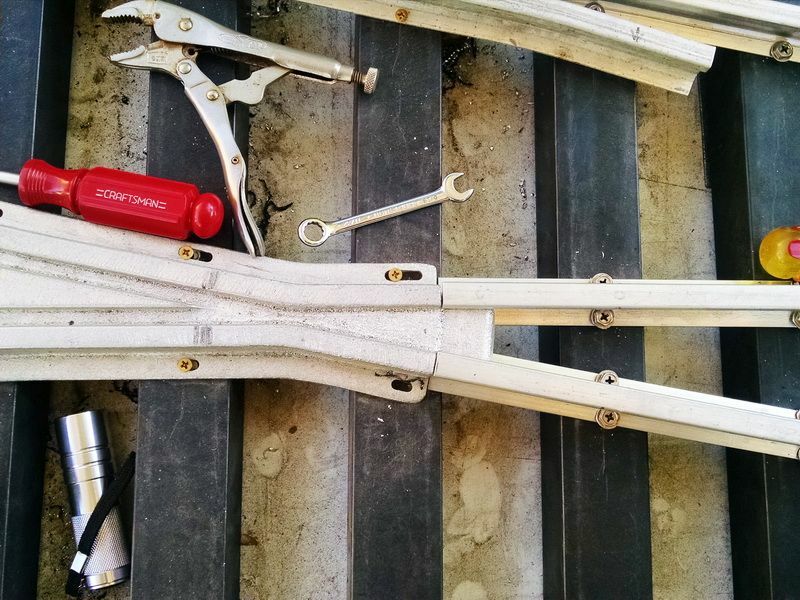 The switch ties on Accutie Products are a new tie recently introduced to make building turnouts in kit form very easy for anyone. 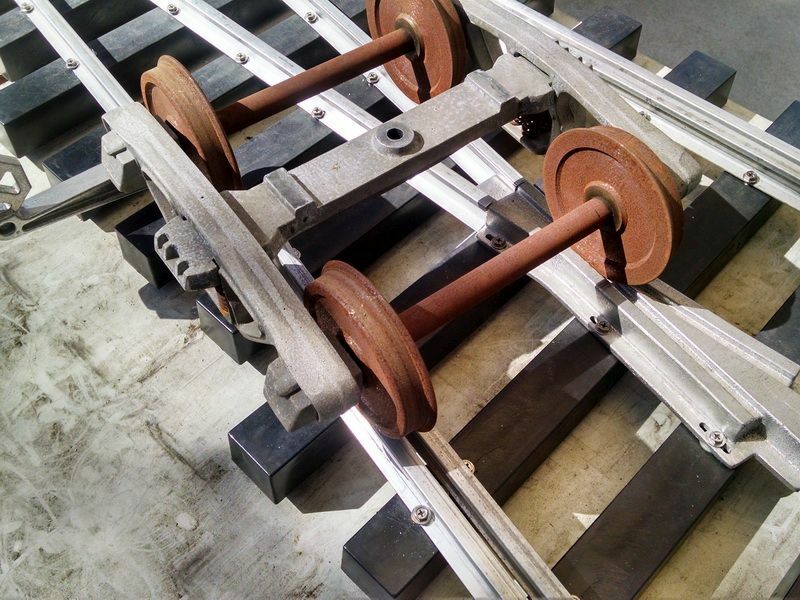 This company uses CNC for all this work.....whether drilling each tie for the holes for the mounting screws, drilling the holes in the rail base and for bending the rail precisely. Like Randy commented when the kit arrives, the ties are each numbered for a specific location on the turnout, each rail is numbered and bent for its location. Just "match the numbers" and screw together. Pretty simple and quick! At $625 for a single kit, it's a "no brainer". The reason it took me so long was that I had to make drill fixtures to get the holes correct for each tie ( BTW, the hole has to be in the exact center of the tie because there is only added material for the screw in the center), bend the rail as close as I could and assemble piece by piece. Without software like my MasterCam, this would have entailed lots of trig and math to do this correctly :). I still don't know how I was able to do this.....just 99% luck I think :).